Do you need extra help for EL students? Try the Main Idea and Details in Nonfiction pre-lesson. Tell students that today they are going to compare and contrast texts that are written about the same topic. Ask students to volunteer definitions for the terms compare (note the similarity between) and contrast (note the difference between). Support students as needed to review these terms. Explain that even if two texts are written about the same topic, they can have different information depending on the author's perspective or the source of the information. When we compare two texts on the same topic, we get more information than we would if we read just one. Provide an image and a definition for the following words in students' home language (L1) and English (L2): "topic," "author," "perspective," "information," and "source." 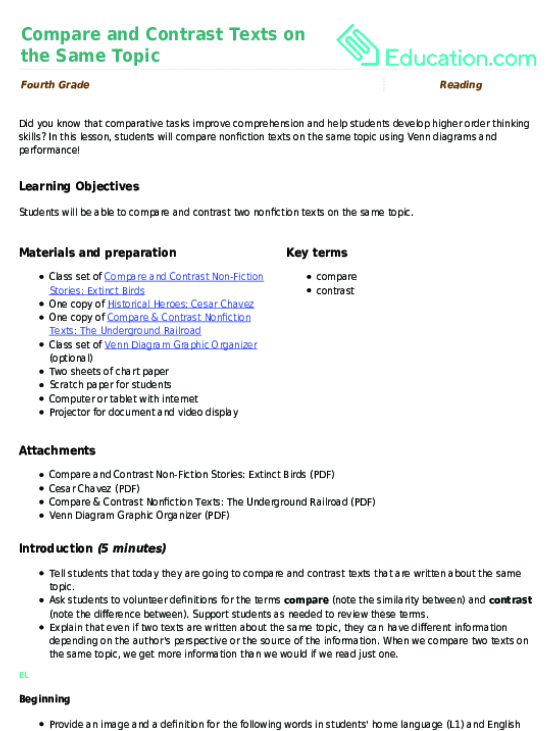 Allow students the chance to discuss with a partner in their home language (L1) or English any connections they have with the words "compare" and "contrast." 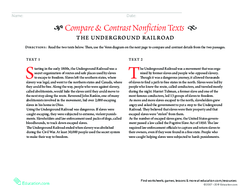 Display the side-by-side texts on the Underground Railroad worksheet and read each passage aloud to students as they silently follow along. Draw a Venn diagram on chart paper and label one side "text one" and the other side "text two." Using a "think aloud," model the process by which you would compare the two texts. Write three or more facts in each section of the Venn diagram (i.e., "The Underground Railroad was dangerous," "Participants who were caught were punished"). 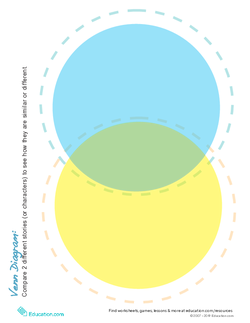 Keep the text displayed while you complete the Venn diagram as a reference for students. Define any unfamiliar terms found in the text in L1 and L2. Simplify the texts for students using a resources such as rewordify.com. 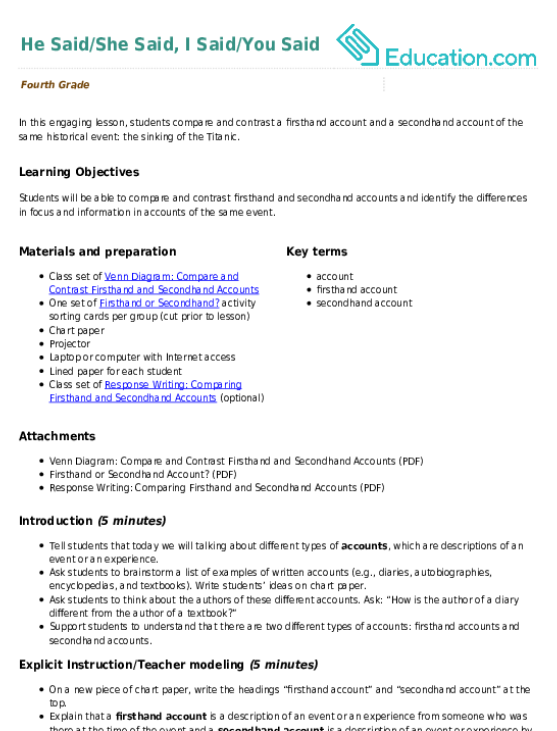 Provide bilingual resources such as an online dictionary (such as wordsmyth.net) or a glossary for students to look up unknown vocabulary words. 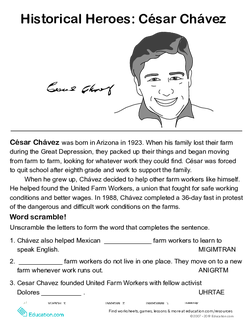 Display the text portion of the Historical Heroes: Cesar Chavez worksheet and read it aloud to students as they silently follow along. Show students the mini video biography about Cesar Chavez and have them take notes on scratch paper as they watch. Remind students to look for similarities and differences between the text and the video. Give students a few minutes with an elbow partner to discuss the similarities and differences they noticed between the text and the video. Draw a Venn diagram on chart paper and label one side "text" and one side "video." Ask students to share the similarities and differences they noticed. Record their answers on the Venn diagram. "The text said ____ while the video said ____." "Both the text and video mentioned ____." Pair ELs with sympathetic and helpful non-ELs or more advanced ELs as they discuss the similarities and differences. 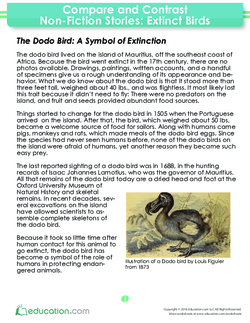 Hand out the worksheet Compare and Contrast Non-Fiction Stories: Extinct Birds to each student. Have students read the two passages to themselves before filling in their own Venn diagrams, comparing the details of the texts. Allow ELs to complete the worksheet in partnerships. Lower the linguistic load of the independent work texts by simplifying them using a resource such as rewordify.com. Allow students to compare and contrast verbally to a partner before writing it down. Highlight the texts with certain colors to show similarities and differences (i.e., blue for similarities and red for differences). Highlight or underline key points as you read text aloud to students (during explicit instruction and guided practice) so that students have visual support as they choose details to include in the Venn diagram. Use texts about a topic that students are familiar with, like pets, so that they can practice the skills learned without the burden of new information. Have students apply the skills learned to compare two texts written about a topic of their choice. Have students choose a social studies or science topic, like the California Gold Rush. Then, have them compare the information in their textbook to a primary source document. Split the class up into an even number of groups (with about 4–5 students per group). Give two groups the same topic (e.g., the rock cycle) and tell them they will be acting out a scene about that topic. Allow all groups a few minutes to develop their scenes. Bring two groups with identical topics to the front of the room. Have one group step out of the classroom as the other group performs. Then have the second group perform while the first group steps out. Invite all students to discuss the similarities and differences between the scenes. Remind them to discuss the facts that were presented, not their personal judgement of the performances (i.e., both groups talked about igneous, metamorphic, and sedimentary rocks). Repeat with other groups as time permits. Give beginning ELs a less complicated topic to act out, such as "things to do at recess" or "going to the movies." What are the benefits of comparing two texts on the same topic? Why are there so many differences between texts? How might an author's bias affect the information that is included in a text? For example, if a slave owner wrote a text about the Underground Railroad, how might it differ from the texts we read today? Place students in pairs to answer the discussion questions first before discussing with the whole class. Provide a student-friendly definition and examples of the word "bias." Provide sentence stems for students to use as they discuss such as, "The benefits of comparing and contrasting texts on the same topic are..." or "There are so many differences between texts because..."
This graphic organizer will help your students organize the important information from two informational texts on the same topic. 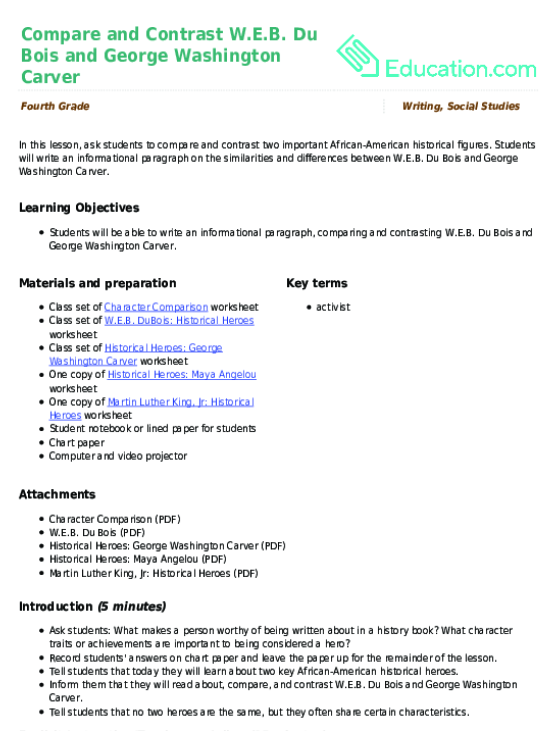 Your students will complete a graphic organizer to record the important information from two historical texts on the same topic.